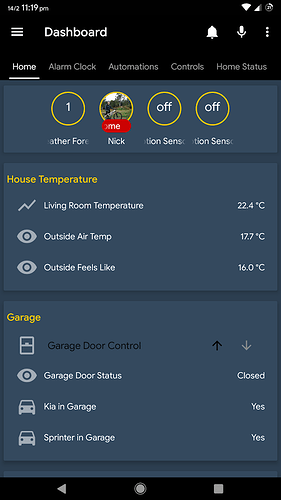 Any chance of getting the lovelace history_graph and thermostat component supported? I’ve emailed over the logs. Looks like also in the very latest update, this “show sensor value instead of icon in badges” is applied maybe too broadly. 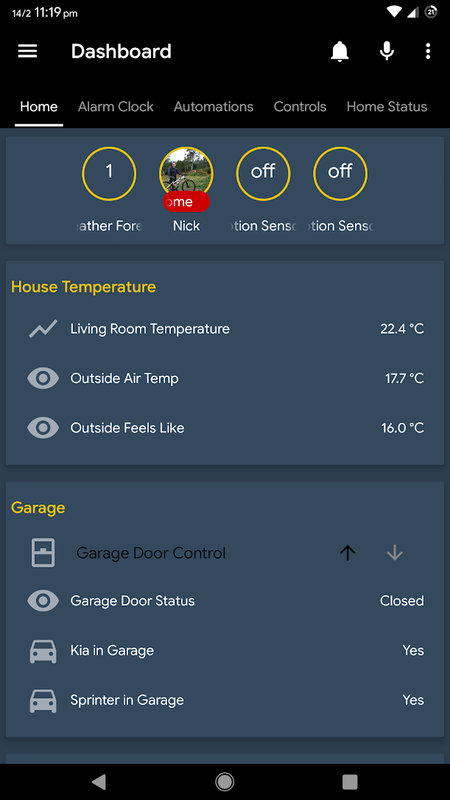 The motion sensor (binary sensor), now shows on/off vs the solid/empty dot and the weather symbol is now just a number. device_tracker is enabled and device tracking is on in Ariela. I’ve added the sensor to my main screen. It show as being away for the last 24 hrs and it’s not showing up on the map. Is there something I’m missing? Enable debug mode in Ariela please and send me the logs. I will take a look and let you know what is wrong. Just installed the app and I’m liking it so far. I have a few locks setup with Lovelace Entity Cards. In the web UI, they have a proper lock icon, but when using Ariela (referencing the Lovelace UI config) these cards have, what appear to be, some default icon that is a circle with 3 dots inside. Is this expected or should I be seeing the same icons as I do in the web UI? As I already switched to lovelace, I’m having trouble reconstructing my lovelace view to Ariela. I’m using custom-button card, it isn’t supported by Ariela, but I’m willing to switch to core button card, that is supported (I think). Now the trouble is that I cannot get the same result as I get with web view. I use vertical-horizontal stack to define the row for the buttons, but when I was testing the new lovelace layout, web view looked like it suppose to, but in ariela all button cards was arranged one by one. I treyed with column number, but that didn’t gave great results. Anyone else using button card, would love some examples that work with Ariela, and still look good in web view? Here is a sample of my web view (don’t mind custom button card and modder, I can live without that), is something like that possible to achieve in Ariela? 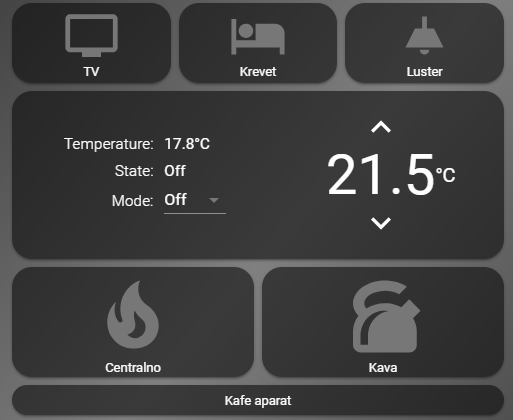 Also is simple-thermostat supported in Ariela? Button card is supported in Ariela. Regarding the vertical-horizontal stack, because some users didn’t realized they have to swipe left / right to show the cards in horizontal card, i decided to make rendering in Ariela show as vertical cards. In i will see what i can do in the future about this situation. Also, thank you very much for the support, i really appreciate. Swiping left right isn’t realy what I’m after, but simply to order my view like in the image above. Swiping is in my opinion better to be left for switching tabs, or eaven better - swiping trough some cards like custom-swiper-card. Also if you use light component with slider, or any slider it’s dificult to be recognized what are you trying to swipe. Are picture-elements going to be supported in the near future? It’s already added to my TODO list. The plan is to support at least all official lovelace cards. Swiping left right is’t realy what I’m after, but simply to order my view like in the image above. Also, version 1.2.8.7 is out. In this latest change, I can no longer open the app when using lovelace (and non-webUI). As soon as I uncheck webui, it crashes and now I can’t open it at all, it just crashes straight away. Is turning on debug mode, and then switching off webui mode going to capture anything usable? I wont be able to turn on debug to capture a start up crash. To get back into the app I need to wipe its setting and start again. I found the issue and i fixed it. The “Ariela” app is really good and works great too. I can start Netflix via HA on my Yoga Tablet. Unfortunately, I can not start “Youtube” via HA, “Youtube” is not listed in the “Sensors” in HA, but “Netflix” is ​​listed here. Is there something blocked by Google? Same here, I deleted the app so I could reinstall it but now I can’t find it anywhere. What do you mean that it wont let you configure server. Can you post a screenshot or something similar?